We are supported by a team of experienced professionals that assists us in manufacturing and supplying premium quality German Bowl to our esteemed clients. This product is manufactured using optimum quality raw material and sophisticated technology in compliance with the set industrial quality norms. 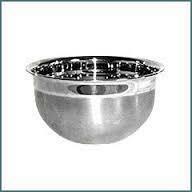 Jayna Steel India brings forth stainless steel Anti Skid German Bowls which are of high quality and durability. We are offering German Bowls to our clients. Be the first to review this product This beautiful saree comes with a running blouse given inside the saree. We offer our clients an array of German Bowls with maximum space. 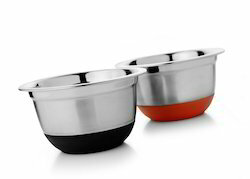 German Bowls are made of superior quality stainless steel, which are highly sturdy, durable and corrosion free. These bowls are available in different shapes and sizes. We offer our clients German Bowls at reasonable prices with various specifications to meet the specific demand of the customers. We provide our customers with a variety of Hand Block Printed Tasar Saree, which is available in a number of enchanting patterns and designs. These Hand Block Printed Tasar Saree are embellished with beautiful intricate embroidery all over that makes them perfect to be worn for parties and special occasions.